Quattro Mani (Susan Grace and Steven Beck) performed in Cambridge Monday. Mahler once quipped that “tradition” often represents nothing more than lazy, outdated habits of mind. In the postwar years, the composer, conductor, and avant-garde firebrand Pierre Boulez weaponized this sentiment through his own outré brand of polemics: Blow up the opera houses! Destroy the Mona Lisa! The Paris Opera is “full of dust and crap”! And in a similar vein, in 1952, at a time when the plaster forming Arnold Schoenberg’s death mask had scarcely dried, Boulez published “Schoenberg Is Dead,” turning an oedipally venomous pen on the founding father of 12-tone music. Schoenberg’s revolutionary art had, Boulez opined, preserved too many formal links to the past. What was needed was a totalizing serialism that, by controlling elements of not just pitch but also register, dynamics, and much else, would surgically sever all outmoded connections to a history long since ready for the dustbin. 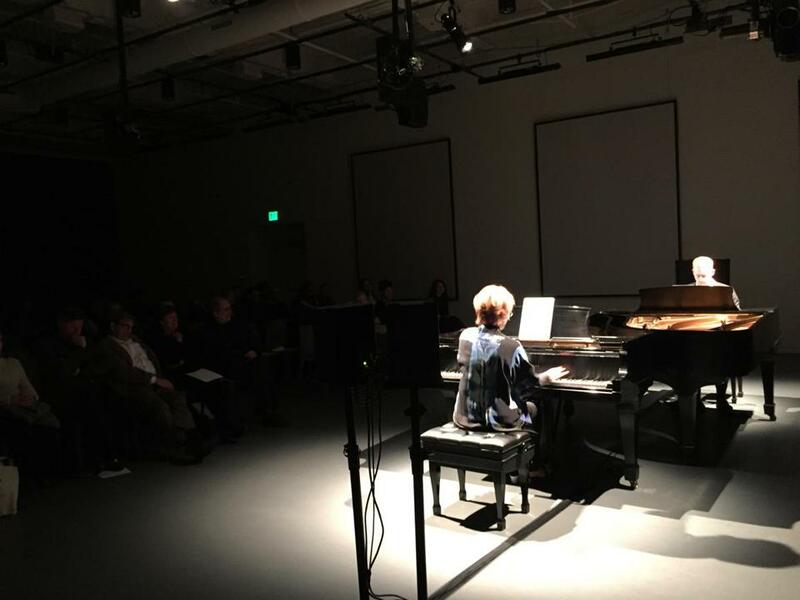 Boulez ultimately showcased the brand of serialism he had in mind with his iconic “Structures I,” a piece that formed the introductory panel and springboard for a fascinating program on Monday night at Le Laboratoire Cambridge. The piano duo Quattro Mani (Steven Beck and Susan Grace) were the evening’s performers. As heard in this duo’s coruscating live performance, “Structures I” (Book 1a) still comes across as a pulse-quickening gem, dazzling in its intellectual compression and in its wildly controlled simulacrum of freedom. The irony, of course, is that the piece also remains profoundly tied to its own postwar moment, as resolutely time-stamped as any of the older masterworks from which Boulez sought to break (and then, later, recorded in suavely luminous performances, naturellement). Monday’s program, curated by Tod Machover, sought to register the midcentury cultural shock waves produced by “Structures I” and by Boulez’s example more broadly. Some two decades later, these same waves swept up Machover himself, who, as a young composer interested in technology, moved to Paris to work with Boulez at his newly founded IRCAM research institute. On Monday’s program, Machover’s own “Re-Structures,” written in 2015, provided the most direct response to Boulez, and a stunning one at that. Commissioned by the Lucerne Festival to honor Boulez’s 90th birthday, and scored for two pianos and electronics, “Re-Structures” on one level seems to read “Structures I” in reverse — that is, through the prism of the more extrovert Boulez works of the 1970s. The music itself manages to be at once technically rigorous, hard-charging, and hugely visceral. Charles Ives and other mavericks may also have been peering over the composer’s shoulder. Yet ultimately, while it’s a clear gesture of homage to Boulez, the piece speaks forcefully in Machover’s voice alone. But in the Rzewski, as in Fred Lerdahl’s “Quiet Music,” in which tonal elements are mesmerizingly shorn of their familiar contexts, Quattro Mani proved itself fearless and equal to every challenge. The night ended with a reprise of a portion of “Structures I,” sounding once again of a piece with its era, but also — as the night had so vividly revealed — angled toward the future. Jeremy Eichler can be reached at jeichler@globe.com or follow him on Twitter @Jeremy_Eichler.